Part 1 kicked off a discussion on Warsteed traiting. Part 2 was for Light warsteeds. 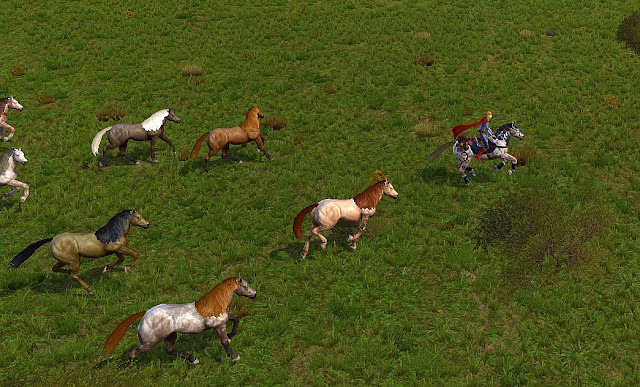 This section will be for Medium warsteed Traits. 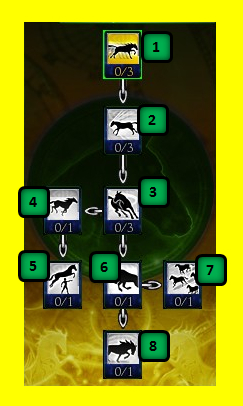 Same as Light or Heavy, there are options to put points into a build for (1) Stat Modifiers, (2) a Red trait tree line called Red Dawn, (3) a Blue trait tree line called Rohirrim, and (4) a Yellow trait tree line called Riddermark. Stat Modifiers: You can allocate as many as 5 points per stat. 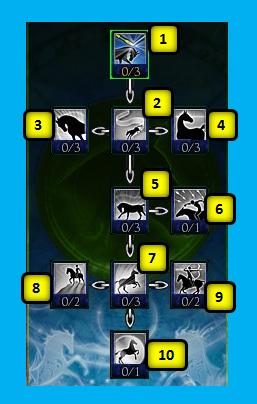 The Medium trait stat modifiers progress like the following table. You can see versus the Light that Medium is going to have more Armor potential but less Agility. I will go into all of those comparisons in Part 5. 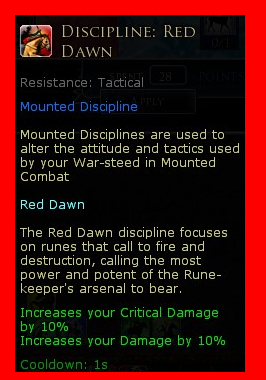 The Red Dawn Discipline is the same (actually all disciplines are the same for all horse types). There is one skill associated with Medium Horse Red Dawn traiting: Arise restores power, which is an interest (if seemingly misplaced skill for Red Dawn). RK Red line traits are Damage based. Again, when in Discipline “Red Dawn”, the RK skills do Fire Damage. There is only one class specific trait, the capstone, “Shields will be Splintered”. Here is the Rohirrim Discipline as it looks for RK. The skills will change to be Healing skills. It is the same for all horse types. 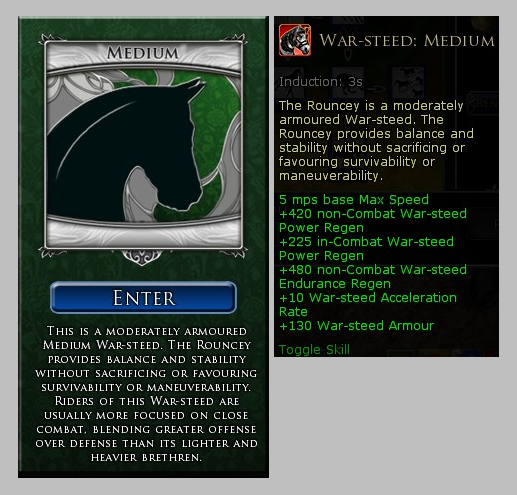 Rohirrim Discipline is for protection: mitigations, evades, and is the heart of your warsteed power and morale (endurance) management. 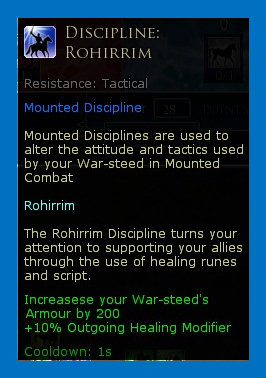 There is one Medium Rohirrim skill: Sacrifice is a protection skill to take no damage. Here is the Blue trait line. To get all these traits and cap the Blue line requires 28 points (corrected 11/19/12). Two traits are class specific: Understanding and Survivability, which are the capstone and the next to capstone skill (similar to Light). Steed takes no Damage while active. Toggle. Cost: 196 power, 49 Mount power. Cost: 50 power per second. As seen in the Light and Heavy, the first four traits have identical names. The Light has the most Acceleration and best turning, but the Medium is better than the Heavy. The “… of the Herd” trait, which is also a skill, is a fellowship bonus and there is one for each horse type; Medium gives warsteed morale and other goodies. 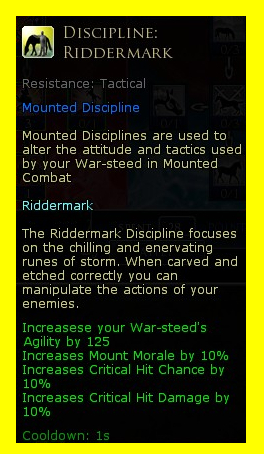 Riddermark has two traits that offer skills: Dash (speed) and Strength of the Herd (fellowship buff). This trait line requires the least amount of points to obtain at 17 points. The Riddermark is the Runekeeper’s Lightning Discipline. 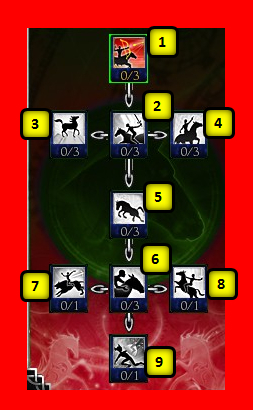 The skills change to lightning attacks while Riddermark stance is set. Only one trait is class specific: the capstone, “Strong Willed”. Forces enemy mount to flee for a short time. Dana, How would you build a Medium horse? A Medium horse is very balanced. It handles much better than a Heavy horse but not nearly as good as a Light. Actually, I have had the best feeling with Medium warsteed when I built it similar to the Light build with stacked Agility and Power. He feels more robust, has higher morale, and still is agile enough to not have the wide turns like a Heavy horse.